After my accident in 2012, I had some "free time" to invest in researching the impact of detraining and rebuilding fitness. My intent was to better understand what losses in fitness I should expect, as well as how long it would take me to recover. I wanted to share the highlights of what I learned, as well as some personal observations. Decrease in mitochondrial ATP production. The curves tend to be exponential in nature, meaning that much of the fitness loss occurs in the first two weeks, with continued loss going out to around 12 weeks. Beyond three months, the additional fitness losses are fairly small. Interestingly, I wasn’t cleared to start exercise until 12 weeks after my accident, so my expectation would be around a maximum of 20% loss in overall fitness. To verify the impact, I decided to check my pre- and post-accident statistics, by looking at my biking and running efficiency. Within Training Peaks, they define efficiency as Normalized Power/ave HR on the bike, and Graded Pace/ave HR on the run. Essentially, this gives you an indication of how much power you generate (or running pace) per heartbeat. Higher numbers are better, indicating that you are generating more power or pace for each heartbeat. I don’t think these are terribly meaningful numbers compared between two people or between biking and running, but I do think the trends over time for one person in one event give insight into your level of fitness. What I found was that my biking efficiency was around 1.39 prior to my accident, and the first couple of weeks my efficiency was around 1.25, translating to a loss of 11.2% loss in fitness. For my running, I was averaging 1.46 prior to my accident and dropped to around 1.35, for a loss of 7.4%. Although this doesn’t sound like that much fitness loss, it felt like much more. Mentally, your rules of thumb (i.e. watts as a function of HR) are significantly off and it’s easy to overwork yourself if you try to match your previous paces or power levels. I used HR zones to keep myself in check, particularly during the first month of exercise. 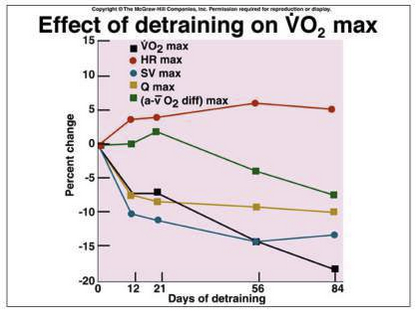 With the most losses occurring in detraining during the first two weeks, the most significant gains appear to be in the first four weeks after starting back to exercise (inverting the exponential curve shown above). I had read that a general rule of thumb was that it takes twice as long to get back to your original fitness level, as the amount of time you spent abstaining from exercise. In my case, the implication was 24 weeks, or nearly six months. Based on my data, it looks like (and felt like) my biking came back at the beginning of May, which was seven months after I started exercising again. Besides seeing similar efficiency levels (around 1.39) I was also getting closer to the same average power levels for my time trials. Biking efficiency over time, post accident. For my running, it appears that my efficiency started to return near the end of March, with a little loss thereafter as I focused more on my biking in April. Running efficiency over time, post accident. For reference, I also plotted seven day total duration on both graphs as well (IM training started after my HIM in early August). Why didn’t I lose as much fitness as predicted? My thought is that it is because I wasn’t entirely sedentary during my “time off”. As soon as I was physically able, I started walking for exercise. I did this for the first six weeks after my accident. I was also doing rehab exercises on my legs and shoulders. After my boot was removed (around six weeks after my accident), I was cleared for light spinning on the bike and running on the Alter G treadmill (at significantly reduced body weight). Although I wasn’t pushing the paces or power, I was getting in some exercise time at Zone 1 levels. I suspect this had a fairly significant impact on keeping my fitness from dropping down to sedentary levels again. My biggest takeaway from this whole experience was not to be afraid of a planned break during offseason. In prior years it was hard for me to take a week off, as I was afraid of the fitness loss. Yes, you will lose some fitness, but it will come back over time. And in my case, when my fitness did come back, I actually performed better with PR’s at bike time trials, sprint triathlons, my Boulder half IM, as well as my Arizona IM. In the big picture… sometimes a little rest and rebuilding is a good thing. How much downtime is too much?